Michigan State head coach Tom Izzo is widely recognized as a master technician when it comes to basketball's X's and O's. In this open look at a Michigan State practice, you will get an unparalleled amount of insight into the offensive philosophy of Coach Izzo. He explains the theory behind his offensive system, diagrams some of his favorite plays and demonstrates them in a live practice setting. Favoring pro-style offensive sets and half-court execution in order to get the right shot, Coach Izzo guides players through every detail within each set's execution. Numerous aspects to the offensive playbook are on display, such as sets relating to zone quick hitters, man-to-man half-court offense, transition offense, and end-of-shot-clock plays. Using whole concepts, Coach Izzo runs through each set multiple times as the coaches actively teach and reteach the offense. Understanding why Coach Izzo runs certain plays at certain times is essential to implement the Michigan State offense. He loves to use set plays to get his guys and the ball where he wants them. You'll learn why Coach Izzo likes to run a pro set and let his players freelance as well. He discusses his player's roles, some of the special players he's had through the years and how he used them. 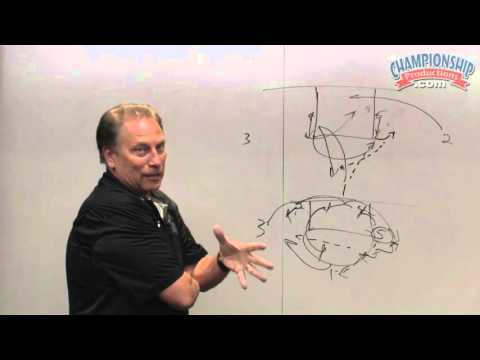 Believing that quick hitters are the best approach to attacking zone defenses, Coach Izzo utilizes a whiteboard to diagram several sets aimed at applying pressure to the weak areas common to zone defenses. With the core philosophy being to always attack from the inside out, each set applies pressure to the back end of the zone, whether it be in the corners or on the blocks. The basic form he sets up is the 1-3-1. Within this set, he is able to attack 2-3, 1-2-2 and 1-3-1 zones. Having a universal set can simplify how your team attacks the zone. Coach Izzo diagrams three of his go-to plays against 2-3 and 1-3-1 zone defenses in addition to demonstrating several more on the floor in practice with walk-through and scrimmage segments. The 1-3-1 Double will free up an open scoring opportunity with a double screen by forcing the outnumbered defense to leave a player undefended. Other plays make use of ball screens, lobs, high post flashes, and pin downs to help you score against the zone in a variety of ways. All plays are on display in a live practice setting as the zone offense segment closes with a lengthy scrimmage session in which Izzo offers corrections in order for each set to be effective. Coach Izzo uses packages of set plays in his man-to-man offense. He breaks down five plays in his Horns and 452 series of quick hitters on the whiteboard before you get to see two scrimmage formats in practice. Utilizing the Horns alignment, each set is equipped with a counter attack that is available depending on how the defense chooses to cover it. All plays are designed to get the ball into the key in some fashion, either by a wing pick & roll towards the middle or a direct entry to either high post player. Learn how to stay organized while playing fast. In addition to Coach Izzo's explanation of the break, you get a chance to see it in action through two practice drills. These drills show you all of the scoring options available with a walk through in the 5-on-0 Break and how they translate in live competition with the Dummy War into Break drill.